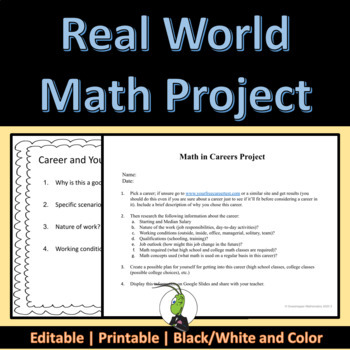 Students will create a PowerPoint (I used Google Slides) that describes how math is used in their future career options. This is great for any level class. I have used this for the days before a vacation if I didn't want to start a new unit or as something for kids to work on after they completed the classwork. This comes with a rubric. Much of the project is open ended to encourage students to use their own creative ideas to solve the problem.